The real and mythical dangers of the wilderness. In the popular imagination, early medieval England was a wild place populated by packs of ravenous wolves, devouring people and livestock. The image is at odds with modern research into wolf biology and wolves were extinct in England by the time of Henry VII. With a programme of wolf reintroduction proposed for the UK, it is time to look back at the history of attitudes to wolves from when written accounts began, in the Anglo-Saxon period. The archaeological and historical records suggest that there was only ever a small number of wolves in Anglo-Saxon England. At archaeological sites, wolves represent a tiny fraction of the faunal assemblage of both domestic and wild animals. Since almost all Anglo-Saxon excavations are domestic sites, we can deduce that wolves were rarely encountered in human settlements. Modern studies have found that wolves prefer to live in uncultivated wilderness, away from people, and will only live elsewhere out of necessity. As such, the paucity of wolf remains in Anglo-Saxon settlements suggests that wolves did not exist in sufficient numbers to put pressure on their preferred environment and lone wolves were rarely forced to enter human settlements in search of food. There are only two known Anglo-Saxon documents that refer to practical measures taken against wolves. One is to a wulf pytt (‘wolf-pit’) in a land grant of 955. The other, from 972, refers to a wulfhaga (‘wolf-enclosure’). Both may be trapping devices. The scarcity of wolves probably contributed to their fearsome reputation, since wild stories about their ferocious gluttony could not often be repudiated through observation. The wolf’s role as the adversary of man and his civilisation is common to all literary and religious references to wolves in the Anglo-Saxon period. As Garry Marvin, researcher of human-animal studies, has observed, the Bible was written for a pastoral economy in the Middle East, where livestock predators could have a severe impact on prosperity. This made the Bible’s allegories comprehensible and literally applicable to similar agricultural societies, such as Anglo-Saxon England. Clerics, including Ælfric of Eynsham and Wulfstan of York, punctuated their sermons with lupophobic biblical quotations (although Wulftsan does not explicitly acknowledge the wolf in his own name). The allegory of the wolf and the flock cemented the reputation of the wolf as the enemy of man, a danger both to the soul and to earthly prosperity. This is unfair: there are no references to wolves killing livestock in Anglo-Saxon laws or charters and, similarly, a study of the reintroduction of the wolf to North America found that wolves accounted for only 0.11 per cent of cattle losses in 2005. Wolves only take livestock in desperation. That wolves live far away from people is reflected in Anglo-Saxon literature, in which they are inextricably linked with the wilderness, a space defined by the absence of man and his activities. This is especially apparent in the Old English poem Exodus, which uses the evocative compound noun mearcweard, ‘boundary-guardian’, to describe them. This suggests that the wolves do not just define wilderness by their presence, but actively maintain it, manifesting the opposition to man inherent in the biblical allegories. Interestingly, there is no mention of wolves transgressing the boundaries of civilisation and wilderness. On the few occasions that wolves are mentioned as man-killers in Anglo-Saxon literature, people have been foolish enough to enter their desolate territories alone. Such spaces are untouched by man, meaning that they are the opposite of civilisation, as manifest in an Anglo-Saxon proverb: ‘The wolf must be in the woods, wretched and solitary [whereas] a good man should labour for glory in his native land.’ It is easy to see how the wolf’s natural behaviour could be construed as hostility towards mankind. The wolf’s primarily symbolic existence influenced a curious Anglo-Saxon law. People outlawed for committing a heinous crime were called wulfheafod or caput lupinum, ‘wolf’s head’, since, in being excluded from the laws of man, they could be killed lawfully by anyone without fear of retribution. This is believed to derive from an earlier practice of formally banishing people by tying a severed wolf’s head around their neck and driving them into the wild. Criminals who broke cultural taboos lost their humanity by being driven into the wilderness and forfeiting their legal protection and so, naturally, became wolves, the opposite of mankind. This association of the wolf, outlaw and wilderness became more literal in later beliefs in werewolves (from the Old English wer-wulf, ‘man-wolf’). 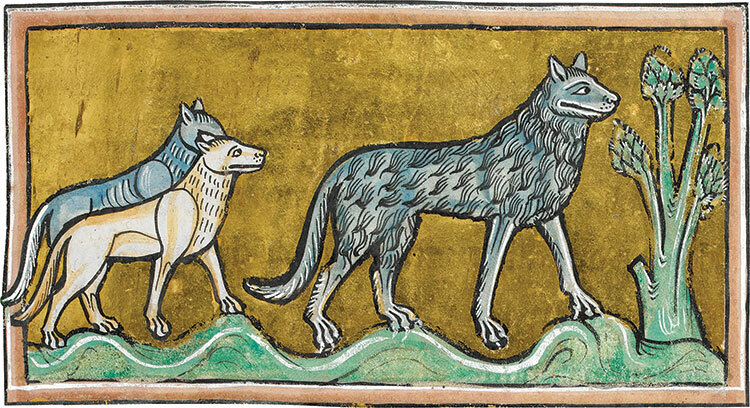 While the wolf was intensely disliked, there were no clear attempts to extirpate the creatures, no surviving historical records mention their danger to people and livestock and enmity was not strong enough to curb the popularity of wulf-compound names (such as Æthelwulf, ‘noble-wolf’) among the Anglo-Saxons. Such names did not reflect a positive attitude towards Canis lupus and we can assume that they took on a significance beyond any lupine parallels they may originally have carried. This begs the question as to why they were eventually hunted to extinction in England and the rest of the British Isles. I would suggest that in late medieval England the rising human population and the increased cultivation it brought led to more human-wolf encounters and hence the desire to eradicate them. In the ecologist John D.C. Linnell’s study of wolf attacks on people, one of the leading causes identified is the development of highly modified environments, which severely reduce the population of the wolf’s natural prey and so force them to look further afield for sustenance. Such an environment would have been created by agriculture altering or destroying wooded and desolate spaces, the habitat of England’s few wolves: the historical ecologist Oliver Rackham estimates that England’s 15 per cent woodland coverage in 1086 had dropped to 10 per cent by 1350. When wolves – hostile or otherwise – were encountered in such environments, reactions would have been influenced by the philosophical and spiritual understandings of them as the enemy of mankind and civilisation developed and fostered in the Anglo-Saxon period. In such a context, the wolf stood little chance of survival. Tim Flight recently completed a PhD at Magdalen College, Oxford, specialising in the Anglo-Saxon period.